The upper arm bone (humerus) is separated from the glenoid socket of the shoulder bone. The arthritic or damaged humeral head is cut and the humerus bone is hollowed out and filled with cement. 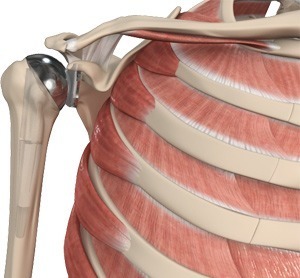 A metal ball with a stem is gently press fit into the humerus. Shoulder replacement surgery involves the replacement of the shoulder joint with artificial components to relieve pain and provide improved mobility of the shoulder joint when other conventional methods fail to provide relief. As with any surgery, shoulder replacement also has risks and complications. It is important you thoroughly discuss both its risks and benefits with your surgeon before undergoing the surgery.